Have your trees been victims of storm damage? How about a lightning strike? If this is the case, getting your trees inspected should be one of your first priorities, post storm. The likelihood of permanent issues from storm related tree damage is increased the longer you wait. Now if your tree is knocked over completely, check out our Storm Damage Cleanup page for more details. Our storm damage clean up services make it easy to have all of your trees inspected while we clean up the debris. Tree Tech Tree Service is a certified arborist and not simply a limb removal company, meaning that all of your storm damaged trees will have thorough and knowledgeable inspections. Who Cares if My Tree Is a Little Damaged From the Storm? 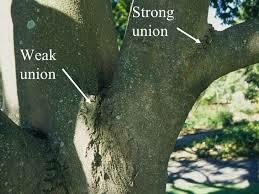 Just because the damage is not evident, does not mean that the tree is not at risk for larger problems. Take for example wind damage. Wind damage can create all sorts of hidden issues and is one of the main factors in trees losing branches in future storms. When the wind is high, the branches cans sway violently, creating cracks in the bark where the branches and the trunk meet. Moisture will work its way into the heart of the tree and cause the branch to crack the next time it gets really windy. This condition can be dealt with if it is caught in time. Lightning strikes, wind damage, hail and even tornadoes are not necessarily the end for your tree. Tree Tech Tree Service can come in and develop a long term plan to save your trees. We will repair the damage that can occur following a storm, ensuring that your tree stays safe and disease free. How Damaged Is Too Damaged? Well that is a difficult assumption to make without inspecting the tree, and if you feel like a damaged tree is threatening your home or the people around it, give us a call right away.